Verkhne-Kumsky, Operation Winter Storm 1942. Some years ago, I put together a 4 day mini campaign game for the Panzer Grenadier series, covering Manstein’s attempt to reach the trapped 6th Army at Stalingrad. The campaign area was formed from four mapboards and the Germans had to drive from one end, to reach the River Myshkova at the other. 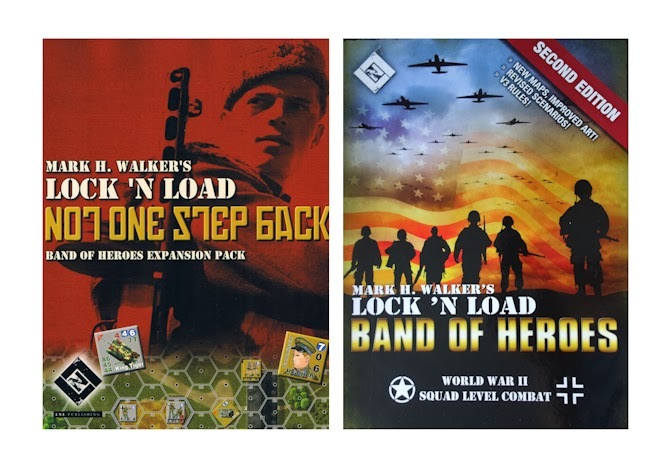 It worked rather well and so recently I tried to convert the idea into a Lock ‘n Load mini campaign. While it looked good on paper, in practice, it lost something with the change in game scale, especially as thirteen miles of real terrain was being compressed into just four L’nL boards. A different approach was needed. The solution has been to do the campaign in a series of linked scenarios, with each scenario giving part of the overall story. 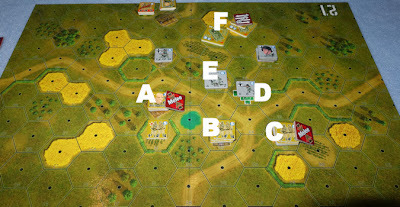 The mini campaign includes a Random Events Table, a few campaign management rules together with historical background and the five scenarios that cover four days of action. Each scenario is stand alone but can be influenced a little by the results of the previous scenario and each contributes a number of campaign points to the overall campaign, so that the level of victory can be benchmarked. The Random Events Table gets activated just once per scenario (the first time that doubles are rolled in combat) and this can add some nice tweaks along the way. At the end of each scenario, there is a chance that the game will be extended by 1 turn only (simply a score of 1 or 2 on a D6). The campaign uses game parts from Not One Step Back and Band of Heroes. You may want to do that now, to follow the rest of this post, which turns its attention to an AAR of a playing of the campaign during the design process (i.e. when tweaks and playtesting were still going on). Scenario 1 - The Bridgehead. Played in 5 turns and worth 1 campaign point to the winner. The Russian set-up is critical to their early survival. If they do not adequately protect the hill from a direct assault across the river, they will be overwhelmed by turn 2 and the Germans will be on their objective. But a strong defence to the front of the hill will almost certainly cause the Germans to set-up further along the river at the unopposed section. This will inevitably lead to an envelopment of the Russian flank, requiring them to shift positions to meet that threat. From the outset it is pouring with rain and this effects visibility, causing each spotting attempt or fire to be modified as though an extra hex of degrading terrain exists (to represent the rain) along the line of sight. This would be like heavy rain always causing a +1 hindrance in some other systems. A/ The Russian 12.7mm HMG is located here on high ground in a foxhole. This is a very good opening position, but it lacks a line of sight to its rear when outflanked. B/ Because of the extra costs in crossing the frozen river, any Germans that set up in front of the hill will not be able to get onto forested hill hexes to melee on turn 1 and they would be exposed to terrible fire, that would likely wreck their chances of success (when I tried this in another playing, one squad went shaken and two others took casualties and went shaken in the opening fires). 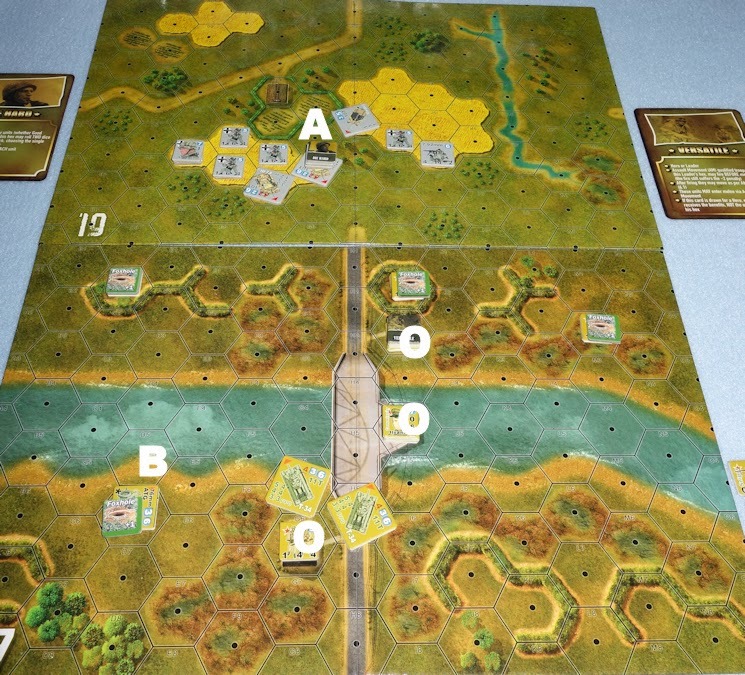 C/ This became the preferred crossing point for the Germans, but it was then hard work to get to the objective (hill) within the 5 turns. D/ The Russian squad on the far left moved down off the hill and into this woods hex to set up a firebase against Germans emerging from the woods. E/ A German squad with a MG34 took a gamble and charged across the frozen river and close assaulted a Russian squad in a foxhole. The Russians were out-gunned and defeated. The position gave the Germans a line of sight to the Russian HMG in ‘A’ and is a good place to set up the MG42 . 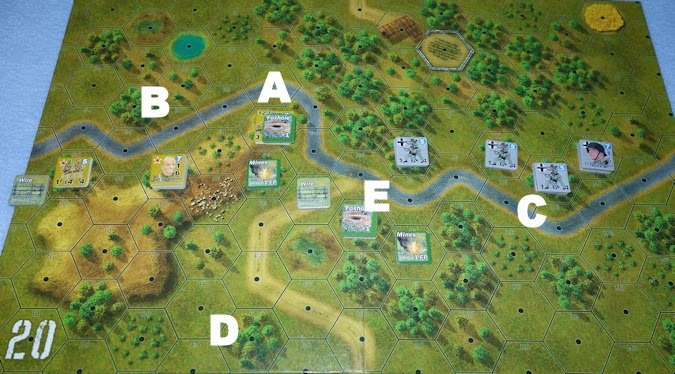 The scenario opened with Lt. Plassmann (near position ‘C’ in the above photo) taking his squad across the river. The Russian HMG from the hill fired and the squad stopped - taking a ‘shaken’ result (like broken in other systems). 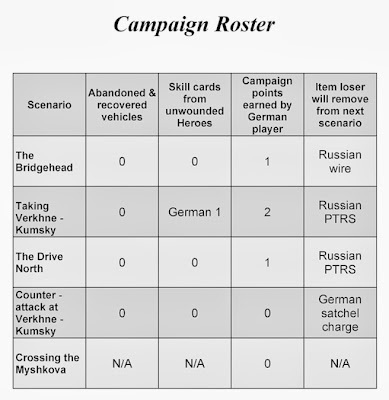 In the campaign game, the first time that doubles are rolled in a scenario causes the Random Events Table to be consulted. It just so happened that on this first attack, doubles were rolled. The dice were rolled again (getting 12) and the Event Table consulted, which stated ‘Excellent reconnaissance of enemy positions, increase the Russian initiative die roll by +1 for the rest of this scenario’ (initiative is diced for at the start of each turn). With the HMG now marked as ‘fired’, the Germans felt more confident to break cover and so another squad crossed the river to assault defenders on the other side as outline in note ‘E’ above. Now that the Russians could see where the direction of attack was coming from, they moved their squads onto the nearside of the hill, to face the threat that would surely come. A/ The Russian HMG is hampered by terrain now, it cannot see the lower ground beyond the high ground in ‘A’. It ideally should move to hex ‘A’, but that hex is mined, so it stays put! [EDIT - I got that wrong, units are not harmed by friendly mines]. B/ Likewise, these light woods will later degrade the view of Sgt. Gorbatov as Germans pass below. C/ Lt. Plassmann has got held up trying to rally the squad that went ‘shaken’ due to the earlier HMG fire. They have low crawled to a nearby wood which will help with their rally check. The Germans really feel the limitations of having only one leader in this scenario. Eventually, the Germans led by Plassmann were able to assault the Russian squad in the woods at the bottom of the board. Clearing that hex, they moved onto the hill and achieve their objective. In the last turn, in a ‘do or die’ attempt, Sgt. Gorbatov took his squad and entered Plassmann’s hex for melee. It was essentially a 1:1 combat, it was the last roll of the game, eight or more was needed on the dice and it was just down to good fortune as to who would succeed .... today it was Plassmann. Conclusion - The Germans take the scenario and collect 1 campaign point. The rain did make a difference to some attacks, as its effect on visibility just swung the result on a couple of occasions. The scenario was not extended by a turn and the Germans forgot to use their mission of 105mm artillery mission, not the first time that I have done that! This is a tough scenario for the Germans. The schedule to make it to the hill gets tighter the further down river they cross. 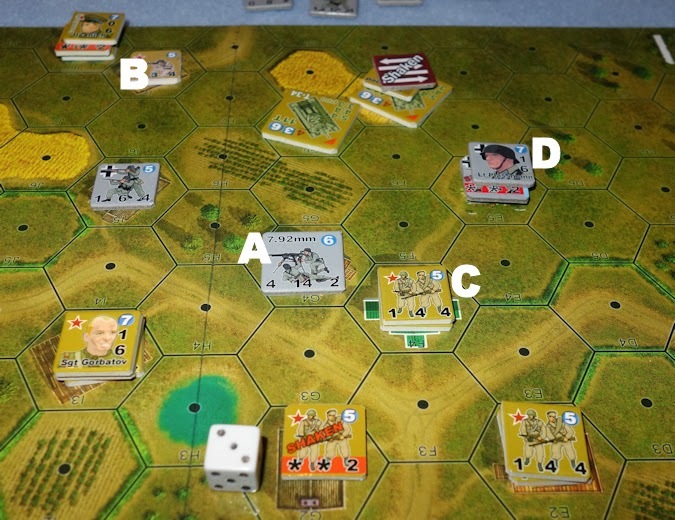 The scenario does give some play balance help to the Germans if the player feels it is needed. Campaign Admin Phase (there is one of these between each of the scenarios). 1/ Scenario winner can recover a friendly abandoned vehicle from the battlefield and use it in the next scenario (not applicable in this case). 2/ The scenario loser must remove 1 counter from their Order of Battle in the next scenario. This will be the Russians. They choose to lose a ‘wire’ counter. Played in 7 turns and worth 2 campaign points to the winner. 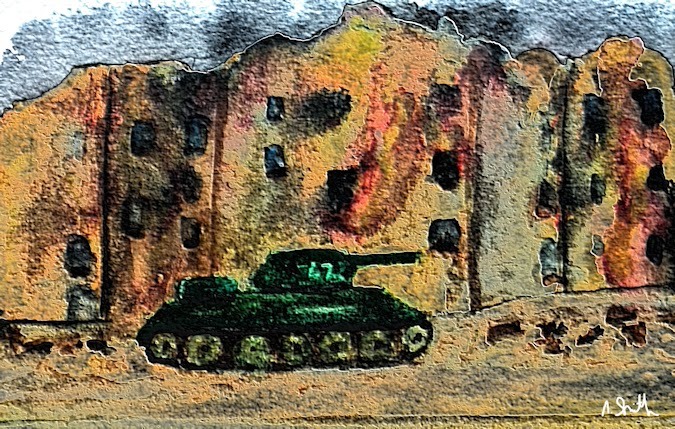 A/ Position of the Russian KV-1 tank, turret open. B/ Position of Russian 12.7mm HMG, protected in a cemetary, this is a tough unit in a tough position. C./ Two PzIIIj tanks, turrets open. D/ The Church. Soviets can self rally here without a leader. E/ Most of the German squads setup here with the leader Lt. Plassmann and they are well armed with MG, satchel charge and flamethrower. There are two engineer squads also located here. The Germans set up in the areas marked as wheatfields on board 19, though the wheatfields are actually treated as ‘open’ due to it being December. They must capture at least 3 buildings to win. 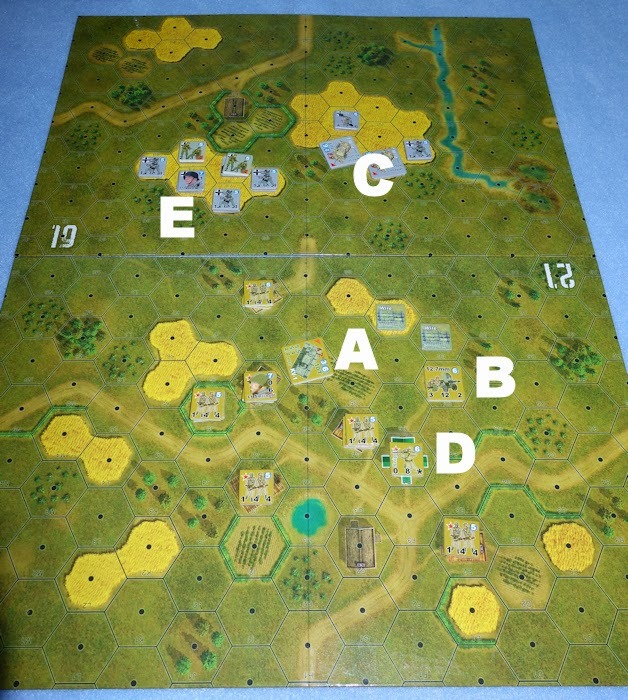 OPENING - From the go, this was an exciting game, it seemed the Germans had hot dice. They got the initiative and a PzIII fired on the KV-1, passing the spotting roll (into degrading terrain) and hitting the heavy tank. They just made it on their penetration roll, causing the crew to abandon the KV-1 and then removing the exposed crew with their MG fire. That fire resulted in the first doubles being rolled, so the event table was consulted. This stated that - "German artillery delivers smoke. The German player immediately places a ‘smoke 1’ counter anywhere that is in the line of sight of any German leader. Then place two additional ‘smoke 1’ counters adjacent to the first counter". The Germans choose to put the smoke in front of the Russian 12.7mm HMG, which fully blocks its line of sight and effectively neutralises it for two turns. The other panzer III spots the Russian squad in the forward house, fires and the squad goes shaken. This was a dramatic start, the Russian carefully planned set-up was suddenly falling apart. HIGHLIGHTS - The Russian sniper comes into play and sets up in the church. Throughout the game he is a menace to the German tankers, causing one of the tanks to then spend the entire game engaging with the sniper, to try and remove him. 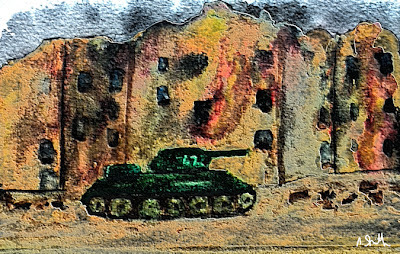 The other PzIII tries pumping a few more rounds into the abandoned KV-1, hoping to destroy it, so that it could not be recovered after the game, but its tough hide left it immune (showing how lucky the first shot was). The Germans take advantage of the smoke and abandoned tank and move everything forward to close the gap. Engineers assault move into a field, but are shaken by fire from one of the houses. A brave Russian squad decides to leave cover and try to melee with the engineer unit while it is so vulnerable. They survive opportunity fire, enter the enemy hex and clear it. Though they themselves are now very exposed, they have denied the Germans that deadly flamethrower. A/ the 12.7mm HMG is blinded by smoke. 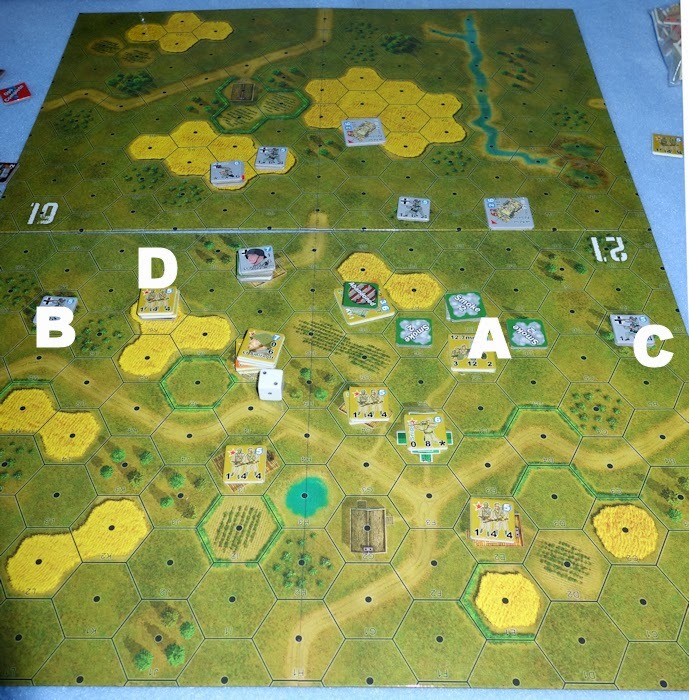 B and C/ The Germans have managed to get into woods on both flanks, but they are in danger of receiving a shaken result and then not having a leader nearby to recover them (that is what happens at C). D/ This is the hex that the Russians assaulted and captured the flamethrower. The sniper fires and gets one of those rare ‘x3 morale’ shots, removing a full German squad that was working its way towards the KV-1 (for cover). Plassmann takes his squads (and satchel charge ) into a strongly held house. In the ensuing melee, he loses an engineer squad, but removes Lt. Smirnoff and 2 squads. The Russians have lost their ability to rally now, except for troops that gather at the church. The German situation is looking equally worrying. Their squads are scattered and three are shaken, with no real prospect of a leader reaching them to help them rally. A Medic had been dashing around the field until he became the victim of MG fire. As the game moves into the final turn, the Russians counter-attack and reclaim one building, leaving the Germans holding just 1 building. The die roll to extend the game fails and the game ends. CONCLUSION. This is a Russian victory. So they get to recover the abandoned KV-1 and use it in their next scenario. It also denies the German the 2 campaign points up for grabs. As the losers, the Germans must remove 1 unit from their next scenario. They will choose to lose the 50mm mortar team. The defeat here has been costly to them and the next scenario will be a harder fight for that. I felt that considering the Germans had such a good start, it had been a tough scenario for them. For the next playing, I gave them an extra engineer squad, deducted one Russian squad and made the appearance of the sniper subject to a die roll. Scenario 3 - The Drive North. Played in 6 turns and worth 1 campaign point to the winner. The Germans enter the board in the south (top end) and must exit four units off the northern edge of the board. This is normally a pretty straight-forward scenario for the Germans, but it has been made a little harder by the arrival of the KV-1 tank, recovered from the previous scenario. The Russian leader is allocated a random skills card. He gets ‘Die Hard’, which essentially allows those with him to roll two dice instead of one when testing for damage and choosing which of the dice to use. A/ The well armoured KV-1 sets up here, flanked to both sides by 45mm anti-tank guns in foxholes. Special scenario rules state the guns can only be spotted on a roll of ‘1’ until they open fire. B/ This Russian squad has a PTRS anti-tank rifle. A PzIII arriving by assault movement makes a lucky spot and both shakes and reduces this squad. 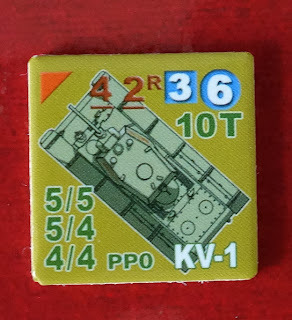 As the second PzIII draws level with the first, the KV-1 knocks it out, but gets the first doubles of the game and so rolls on the Random Events Table. C/ This area with a house and hedged perimeter is held by 3 Russian squads, a light machine gun and a leader. Beyond is mostly open ground, so this is a good defensive position against turn 1 German arrivals. 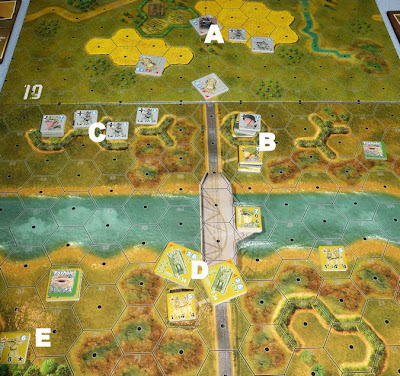 The Russian pass on each turn, allowing all the Germans to come onto the map before selecting targets. The random events table produces rain for the entire scenario. Like in scenario 1, this reduces visibility by adding in an extra degrading penalty to any fire or spotting (like hindrance in other systems). A/ This squad with the anti-tank rifle is shaken at the moment, so not a threat to the German tanks. B/ The three PzIII’s. The one at the back has infantry moving with it for cover. The front right tank was knocked out by the KV-1. C/ Lt. Plassmann has his work cut out with four shaken squads. He will spend the game trying to rally them, rather than using his abilities to get units forward. With their infantry mostly shaken, the Germans decide to just push down the right with their vehicles and the two remaining squads to exit the map. They use assault moves, to get some fire laid down but as they move forward, targets for both sides move out of the forward arcs and turrets have to pivot to track their targets. The penalties of turning turrets, pivoting guns, the rain and assault fire, all conspire to make the firing from both sides frantic, exciting but not effective. The Russian infantry abandon their positions at the farm and start to dash back to ‘catch’ the advancing Germans who have moved well past their flank. Final positions before the Germans leave the board. A/ The Russian squads from the farm are trying to catch the Germans. B/ There is a squad moving with this tank. C/ The shaken 45mm anti-tank gun can self rally and does, but all fires are ineffective. By turn 4 the Germans were in a position to get three vehicles and 1 squad off the map, which gave them a victory. 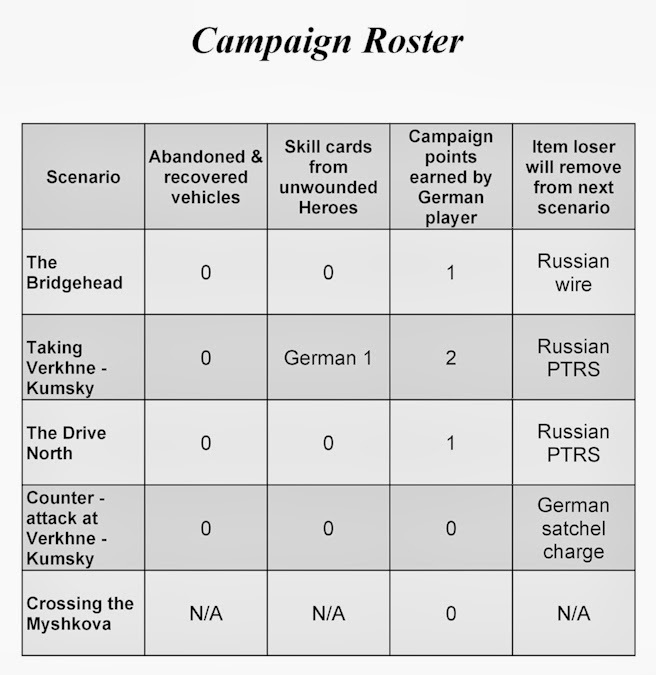 The Germans earn 1 campaign point and the Russians will have to remove a counter from their next game (they will choose to remove an anti-tank rifle). This was quite a tight finish. Had the Russians just managed to knock out the lightly armoured SD 222 armoured car, it would have delayed the chance of German victory by one turn and that probably would have been enough to turn the tables. EDIT - after further testing, I felt that 4 vehicles in the German OoB was too much as it encouraged them to race with them down the map and exit quickly with the vehicles, which they could do if the Russian A/T got unlucky. The final production has dropped one of the PzIII’s, so they always need to work with their infantry now to get off the board and win. Scenario 4 - Counter-attack at Verkhne-Kumsky. Played in 6 turns and worth 3 campaign points to the winner. The Germans hold the village with a garrison force while the main body press on for the Myshkova River. 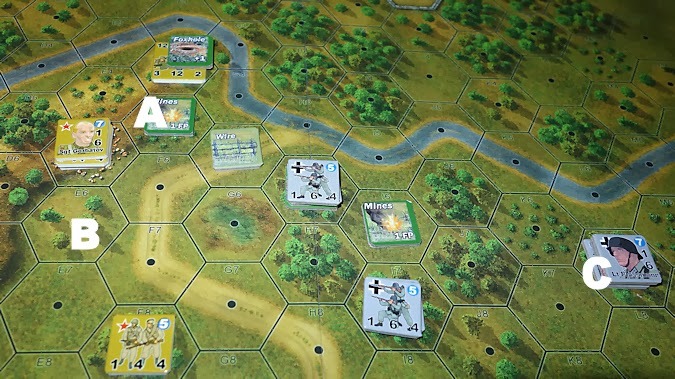 The Russians counter-attack the village from several sides and the main force has to turn back and assist. The Germans set up in buildings with the HMG controlling the centre of town. Lt. Plassmann is in the cemetary with a squad and a machine gun. The Russians must enter the board from at least two sides and openly allocate the forces to the respective board sides during set-up (as the Germans might get the initiative and move to respond). The Russian leader Gorbatov draws the ‘erratic’ Skills card, which means if he is attacked, the result is either negated or doubled in effect - a wild card that he could do without perhaps. Wheatfields are again open ground. the Russians have entered from both the north and the south edges (top and bottom). A, B and C/ These buildings are all captured by the Russians with relatively little loss. This surprised me because in a previous game, the Russian virtually lost the game by turn 2 due to losses while attacking from this direction. D/ A German sniper has irreverently taken up residence in the church. E/ The German HMG can hold most at bay, but here it is close to being overwhelmed. F/ Two T-34’s have entered the board using assault movement and the Commissar and two squads are trying to get into the nearby building to capture it. A/ The Russians do not fancy the prospect of close assaulting that HMG. However, one of the T34’s fires at it, it goes ‘shaken’ and this makes it safe for a Russian squad to assault and remove the weapons team. B and C/ These buildings are now also Russian occupied. ‘C ‘is a church and Russian squads can self rally there (scenario special rule). D. Lt. Plassmann gets +2 cover from the cemetary which is good against fire and when rallying, but over a few turns, he and his squad have been subjected to terrible fire and most of the time, they are shaken. A and B/ German reinforcing squads have, with Pz III tank support, re-captured two buildings. C/ Off-board 105mm artillery fire has shaken ‘B’, encouraging ‘C’ to move out to assault. They survive opportunity fire from ‘A’ and enter the Building at ‘B’, removing the shaken defenders. D/ A close quarter tank battle ensues, leaving both Pz III’s as smoking wrecks. The scenario ends early, as there is no way that the Germans can make any further progress, they have lost by a wide margin. Failing to get those 3 campaign points is a serious blow. The Germans must now remove 1 item from their next and final game. They choose to lose a satchel charge. [note - I forgot to roll on the random events table, I have rolled now just to see what might have happened. I got a ‘4’, which states, "Pioneers - The Germans place a 2-3-4(5) squad and satchel charge with or adjacent to any friendly leader". We will never know to what extent that would have made a difference, certainly some of the Russian melee’s might have needed a bit more consideration. EDIT - Later changes to this scenario gave the Russians an extra two squads and the German reinforcements were strengthened by 1 squad. In our most recent game, it all literally went down to the last die roll. 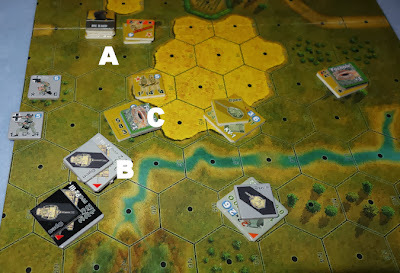 Scenario 5 - Crossing the Myshkova. The German objective is to capture 2 out of the 3 buildings on the river board. The River is frozen, but tanks cannot cross it except by the bridge. The bocage terrain is treated as ordinary hedge and the wheatfields are just open hexes. 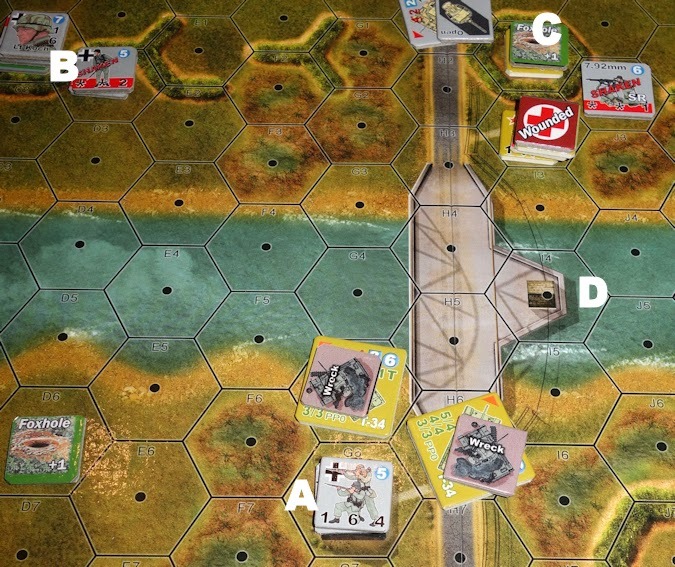 The sides of the bridge are treated as walls for line of sight purposes and units cannot enter the bridge from a frozen river hex. 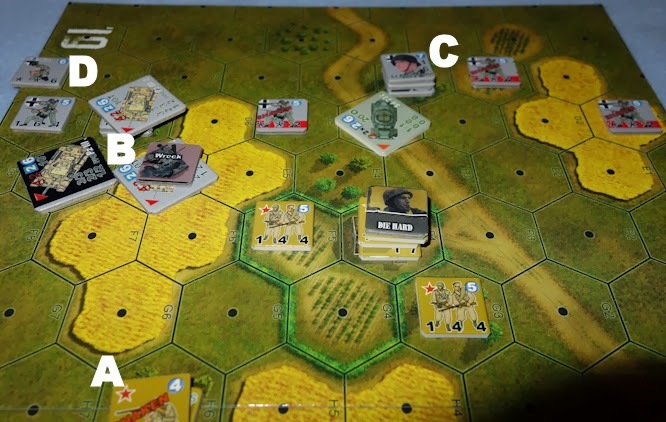 A/ The German forces set up on the top board in any of the yellow hexes (wheatfields at other times of the year). B/ Russian 76mm anti-tank gun with foxhole protection. EDIT, this was removed from the OoB after further playtesting. 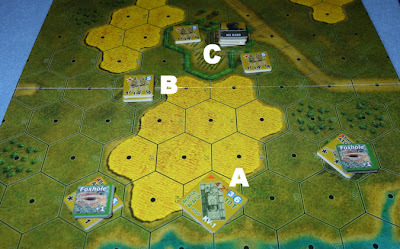 O/ the three O’s show the three building hexes that are possible German objectives. They must capture two of the three hexes to win. On this side of the bridge, there are two T34 tanks. They are really hampered because of the marsh (prohibited to them), so they have taken up these static positions. A/ The German lightly armoured Marder I has been destroyed following a duel (firing down the road) with one of the T34’s. B/ Lt. Plassmann has assaulted the hedged marsh and defeated the occupants. In turn he and his squad will go shaken from adjacent fire directed by Lt. Smirnoff and then be removed from play as the Commissar takes his squad from the building on the bridge and melee’s with Plassmann. The Commissar then comes under pressure and needs rescuing and is joined by Sminoff and his squad. This puts a lot of troops in one place and they suffer grievously, mainly from adjacent assault moving tank fire. They fall back to the adjacent building. One of the fires causes doubles. The Randon Event Table is consulted. A 9 is rolled - "Commissar takes Command - immediately swap out a Russian leader currently in play for the Commissar counter". This event has no effect since the Commissar is already in play, he is presently however unfortunate enough to be looking down the gun barrel of an adjacent PzIII tank and taking fire. C/ The Germans make it to the hedge, which in this system offers no protection . The Germans are obviously going to push down their right flank, perhaps to cross the river and take the bridge from the rear. D/ The T-34s takes out a PzIII, but in the fight the T-34 on the left is lost and the one on the right spends most of the game shaken. E/ The Russian sniper pops up here and keeps the pressure up on the hedge line. EDIT, further playtesting caused me to remove the sniper from the Russian OoB. A/ A German squad has crossed the river, removed the sniper and then captured the bottom building - there was a lot of dodging of bullets involved! B/ Lt. Koch has spent the entire scenario trying to rally troops, who have had unfortunate dice rolls. Two other shaken squads have been ‘low crawling’ to his position. D/ Both sides really are on their last legs. The squad defending the building on the bridge has had to move up to support the building, where the commissar lays wounded. At the end of the scenario, a die is rolled to see if play is extended by one turn - it is not and that concludes both the scenario and the campaign. T34 tank from my 10mm collection. Conclusion - Well as a campaign, that went about as badly for the German side as it could. They won two of their five scenarios but only scored two campaign points. On the victory point table, this translates into "Stunning Russian victory, it breaks the illusion of German invincibility." In fairness, this after action report was just one set of playings that I used while tweaking orders of battle and scenario conditions. The L’nL system is very dynamic and from the go, things can go off in many different ways and so balancing has to be done in fairly broad strokes, such as knocking Russian 1-4-4(5/5)’s down to 1-4-4(5/4)’s or increasing the scenario by 1 turn or adding a medic rather than a leader etc. Some of the ‘beyond the players control’ touches can turn out nicely. I liked how in this campaign, the abandoned KV-1 tank survived scenario 2 to add a different twist to scenario 3. The Random Events Table regularly delivers an interesting diversion to the flow of play without (I hope) being too detrimental to the ‘other’ player. 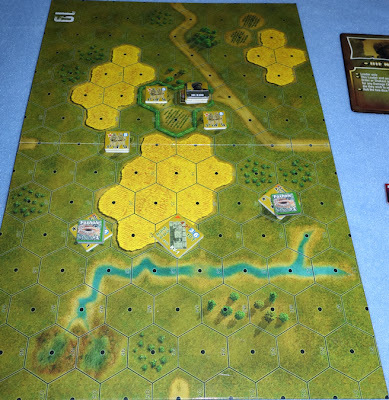 I quite liked the way the original Panzer-Grenadier mini campaign played out, with the whole campaign area permanently on the table, giving the ‘big picture’. But overall, I am happy that the linked scenario was the way to go for L’nL in this particular instance. Only time will tell as further playing reveal the strengths and weaknesses of Verkne-Kumsky. 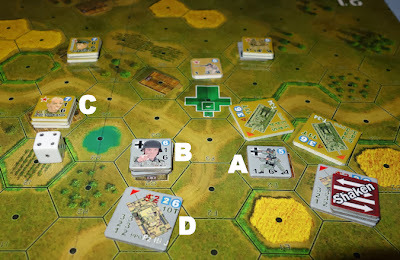 For those wanting to compare the differences in presentation of the two mini campaigns, here is a link to the Panzer Grenadier file at BGG which was updated by someone to take account of some minor modifications in version 3 of those rules. NOTE 1 - Here is the roster to my most recent campaign game. It gave the Germans 4 VP’s, described as a "Russian victory, enough delay to ensure Stalingrad is not relieved". NOTE 2. There is a video that supports the campaign download. NOTE 3. Last night we played scenario 4 as a stand alone game and it was a German victory, that went down to the last die roll. This has been a long post, thanks for sticking with it to the end. Norm.